Cyberpunk is dead. Long live the Cyberpunks. Actually, the c-word field may not be dead, but it seems to have achieved its purpose and the authors of the movement are moving on. Bruce Sterling’s Islands in the Net, though definitely a progeny of the movement, carries a much larger humanistic message within it. The same could be said for Lewis Shiner’s Deserted Cities of the Heart, which sliced the “cyber” off with a flick of the stiletto and decided to just be “punk.” And the cyberfather William Gibson with his latest, Mona Lisa Overdrive, matured into the Zen prophet of cyberness and seems to have wrapped it all up for the Sprawl. And, beyond some of the more fringier Cyberfellows like Rudy Rucker (who writes strange, “transreal” stuff without the need of spiffy titles), Marc Laidlaw, Tom Maddox, and Paul di Filippo, John Shirley seems to be the last kid on the block still fighting the revolution. Or is he? The Eclipse trilogy, billed as “the ultimate cyberpunk epic” has recently seen its second volume, but Shirley’s latest work is about as far away from the seamy undersides of technology that you can get. Subtitled “An Interplanetary Fantasy,” Shirley’s A Splendid Chaos is indeed a chaotic turn of events from the cyberfield. Shirley’s curve ball in this sequence isn’t the fact that A Splendid Chaos is fantasy. Shirley’s 1980 novel, City Come A-Walkin’, straight fantasy in any sense, blasted the staid fantasy field because of the wealth of originality within it and the punk sensibilities. Forget the unicorns and pink furry dragons that inhabit your normal fantasy–City Come A Walkin’ was about a walking manifestation of San Francisco, and its accompanying fight against the totalitarian system of monetary control was a story for the eighties. Seedy, paranoiac, and anarchic–fantasypunk, if we must resort to labels. 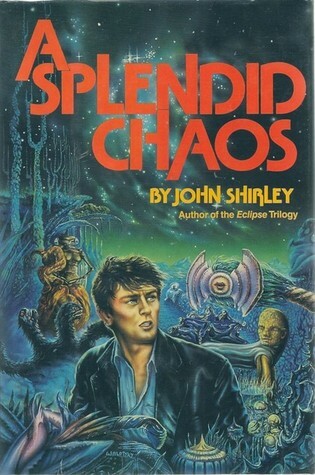 But A Splendid Chaos isn’t like City Come A-Walkin’–just like it doesn’t resemble the Eclipse work or Shirley’s horror novels. In a totally new departure, Shirley encroaches on the field mined by Piers Anthony and Jack Chalker in their early novels, and what John Varley proved in Titan could be done in an intelligent manner. Plop a bunch of humans together with the weirdest assortment of aliens that you can conceivably manage (throw out the physics book, it’s okay), and see what kind of story you can get out of it. If that makes it sound as if A Splendid Chaos was written haphazardly, I’ve given you the wrong impression. Sure, that’s what the plot boils down to, but the simplest plots can belie the variety of expression and characterization. Shirley has dropped the “punk” from his repertoire for this book, thought it lurks somewhere in the background like an injured child, and for the most part concentrates on achieving the most alienness that he can manage. And he succeeds, creating a unique cross-section of races and a world that he brings vividly–mainly in purples and bright green–to life. Just like Shirley’s punkness remains in the background, occasionally popping up for a brief visit, his dabbling into the horror field is also evident. For example, despite the fantasy subtitle, Shirley lives by the rules he gives himself. So that, although he has a form of magic incorporated into the novel (IAMton particles–possibly a Rene Descartes allusion? ), when he kills off a character, it’s uncommonly like the real thing–violent, messy, and permanent. Like a self-fulfilling prophecy, A Splendid Chaos is exactly what the title says. A little bit horror, some fantasy, a measure of punk, and a lot of Shirley mixed in a 400-page novel that is quite splendid. And is anything better than that?